Ready Player One, the hit novel that's now a major movie, is packed with tech nostalgia. From Atari 2600 video game consoles, through 300 baud modems to Sinclair ZX80s, the book is bursting with references to the technology kids of the 80s and 90s grew up with. For over a century, technology has defined not just how we produce popular culture but how we consume it. From the first TV through to the growing virtual-reality industry, every generation past, present and future relates to culture through the lens of its favourite technology. In homage to Ready Player One here are some the technologies that have changed the way we view and consume our favourite films shows and games. Which ones do you remember? Just its name would make many of us chuckle today. The 1920s system relied on a perforated rotating disk or mirror to scan a scene and generate a video signal that was sent to the receiver. Cathode ray tube TVs were made commercially available from the mid-1930s and remained popular for decades. It's how most people would have watched the moon landing in 1969. The distinctive funnel-shaped device may have been overtaken by flats-screen TVs in the mid-2000s, but it has experienced a resurgence, as the response times (how fast the pixels refresh) of CRTs are preferred by gamers. Today, we've moved beyond screens being 'single' or limited use at the centre of our home, and we are now surrounded by displays that can be configured to play our favourite content, show information, or even control devices within the home. Renown ed inventor Nikola Tesla created one of the world's first wireless remote controls for a remote-controlled boat, which he unveiled at Madison Square Garden in New York City in 1898. 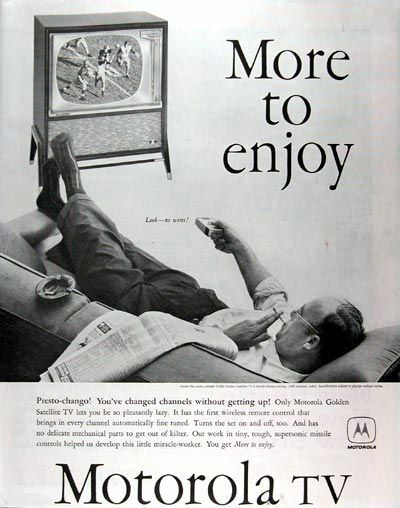 Motorola, now part of ARRIS, released its first TV with remote in 1956, the Golden Satellite. Remotes continued to be key to the modern lifestyle. While the 'lazy bones' used a cable, the Zenith Space Commander 'clicker ' used ultrasonic sound. In the 1980s, remotes began using the infrared light signals that are most common today. Now we interact with our content without even using our hands. Voice control is gaining a foothold and signposts frictionless future interactions with our devices. T he Video Home System (VHS) was released in Japan in late 1976 and in the United States in early 1977, changing viewing habits considerably. For the first time, people had the power to record, rewind, fast forward and store their content. It's well documented how JVC beat its rival Betamax in the format war, emerging as the dominant home video format throughout the tape media period. As of 2005, over 95 million Americans owned VHS format VCRs. We've since moved on to DVDs and Blu Rays, and streaming via cloud-based services, which provide greater flexibility, a huge amount of possibility when it comes to features, and almost no physical footprint for the viewer in terms of content storage. 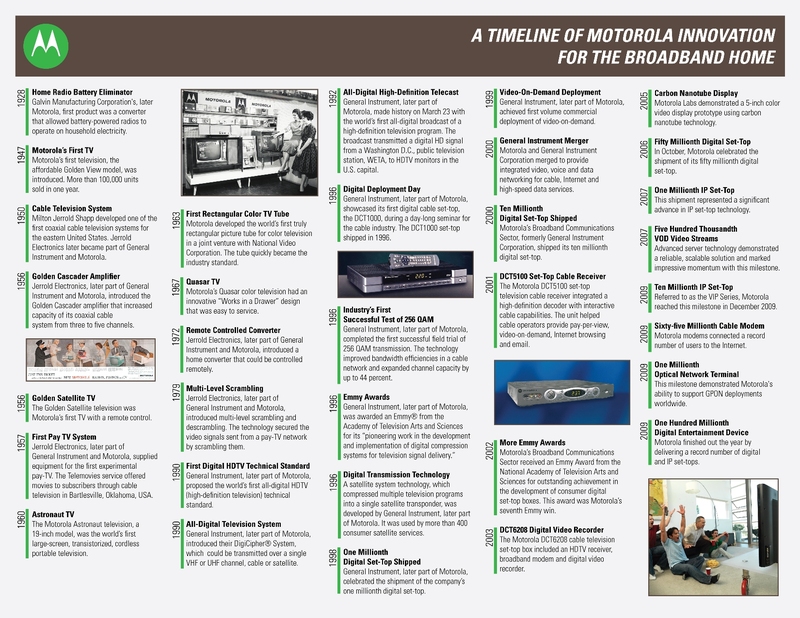 Wi-Fi was first released to consumers in 1997 and, since its introduction, has become integral to our lives. In television, it has contributed to greater connectivity and enabled us to live stream content into our front rooms with vast amounts of data streamed straight to our televisions and onto our devices. Wi-Fi is now used throughout the entire home. The challenge therefore is to create and maintain strong networks that can support more connected devices, ensuring that we all get the best experience and realise the potential of the Internet of Things and VR, just to name a few. IPTV is the delivery of television content over Internet Protocol (IP) networks. This is in contrast to delivery through traditional terrestrial, satellite, and cable television formats. It first appeared in 1995 and allows people to view content on-demand. For providers, it meant new technological challenges like storing hundreds of hours of video for personalised consumption. IPTV services were the first to offer huge volumes of content and bespoke experiences to viewers before online-only players like Netflix grew in popularity. It remains a strong model but many have adapted 'skinny' bundles and partnerships with OTT players to keep pace. Today, it's not just the content but the experience that wins and retains customers for IPTV players. With digital producers like Netflix, Apple and Google, pouring billions into creating programmes and owning distribution platforms, we will continue to see developments in the way programmes reach audiences and significant changes in the broadcast model. Founded in 2005, YouTube made the audience the content producer and completely changed, once more, the way we consume content. Power was also given to the viewer with regard to when and what they watched. An unlimited number of 'channels' created a huge range of choice and the birth of the social media star contributed to a change in culture. YouTube also ushered in an era where computers started to become the primary screen and paved the way for platforms like Netflix, which was founded in 1997 – albeit as an internet-based DVD rental company. The next platform of content creation will be augmented reality as we use our phones to superimpose images onto the real world and become characters in our own life stories and productions. H DTV provides a substantially higher resolution than that of standard television. The term 'high definition' once described a series of television systems originating from August 1936; however, these were only high definition when compared to earlier systems that were based on mechanical television. The ongoing competition between companies and nations to create true "HDTV" spanned the entire 20th century, as each new system became "more HD" than the last. By the beginning of the 21st century, advances in broadcast and consumer devices have bought HD into most of our homes. But the race continues with content producers looking create 4K and 8K content that can fully demonstrate the capability of systems entering our homes. Launched in 2007, the iPhone was the culmination of many other leaps in technological development over the last 50 years and the catalyst for widespread mobile viewing. It has been instrumental in televisual entertainment, as well as video calls and gaming. The mini screen of the smartphone has shaped what we watch and how we watch it, and short form video has become the norm – as has live streaming and watching television on the move. It, and all smartphones, will become more integrated into our everyday lives, as the number of devices we require gradually get smaller and smaller. Soon mobile will literally go mobile, with self-driving cars speculated to become moving entertainment hubs as drivers get their commuting time back. Ok , so Ready Player One's virtual world, the OASIS, isn't here yet. But fully immersive experiences are changing not only how we view and participate in content but potentially how it's told too, with the advent of nonlinear, 'choose your own adventure'-style programmes. Consumer headsets and even folded up paper in the form of Google Cardboard have made all this possible. What will make this all possible is allowing for huge amounts of data to flow seamless through the home. ARRIS is working alongside industry partners to evolve existing networks that will allow this, enabling the entertainment of the future.